The MOV file extension normally represents a QuickTime multimedia file. QuickTime is a movie/video/multimedia format developed by Apple and is often used in websites, mostly for streaming audio or video. The advantage of MOV files is the ability to contain abstract data references for the media data. That means that they can be easily edited - no need to rewrite all media data after editing. By using a QuickTime player that either comes with a Web browser or downloaded from Apple or the browser company, you can view and control brief multimedia sequences. Unfortunately, QuickTime is not compatible with DVD, so a free DVD ripper for Mac to rip DVD to MOV is necessary for Mac OS users. MacX DVD Ripper Mac Free Edition is the best choice. MacX DVD Ripper Mac Free Edition is a free DVD ripper software which can help you rip any DVD to MOV on Mac free. With this free DVD to MOV ripping software, you can enjoy DVD movies on QuickTime with ease. Meanwhile, it delivers a super fast solution to convert DVD to MOV format, namely less than 30 mins for a 2-3 hour DVD movie. Anyway, here is a step-by-step guide to introduce the way how to rip a DVD on Mac to MOV format with this free Mac DVD to MOV Ripper. After Free download and run MacX DVD Ripper Mac Free Edition, Click "Disc" button or add DVD folder by clicking "Path" button to load your favorite DVD. After loading DVD, the DVD's information will be shown in the file list, such as title, subtitle, duration, output folder etc. Choose "to MOV" as output format. FYI, besides the ability to convert DVD to MOV for QuickTime, this DVD to MOV ripper is also versed in ripping DVD to MP4 and M4V formats, such that you can play DVD on your iPhone, iPad and other Apple devices on the go. 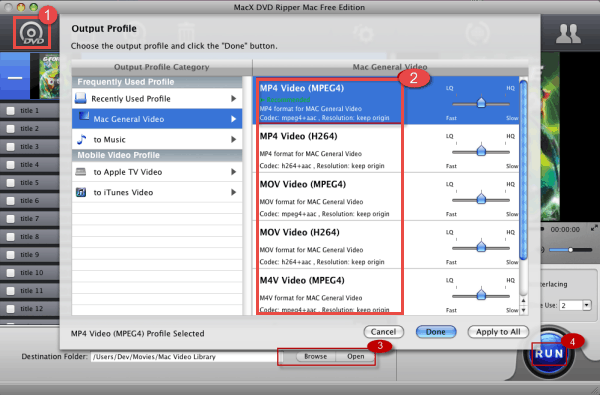 When the settings are done, click the "Start" button to start conversion, and then this free DVD to MOV ripper program will automatically start to copy DVD to Mac in MOV format. In conclusion, MacX DVD Ripper Mac Free Edition works like a charm on converting DVD to MOV files, as well as other mainstream video formats. Well, if you wanna convert DVD to some other formats or rip encrypted DVDs, the advanced edition - MacX DVD Ripper Pro is a nice choice. It features to rip homemade DVD as well as rip protected DVD, even the new movies on DVD to other popular video & audio formats, like MP4, FLV, MOV, MPEG, iTunes, MP3 for playback on QuickTime, edit with iMovie, upload to YouTube or transfer to portable devices. Note: If you are willing to watch MOV movies on mobile devices, check the MacX MediaTrans to transfer MOV files to iPhone without any hassle of format incompatible issues. How to Convert DVD to MOV on Mac? This is a tutorial about how to convert DVD to MOV on Mac. You can use this DVD to MOV converter for Mac to rip commercial protected DVD and homemade DVD to MOV files with 3 simple steps. This DVD to QuickTime MOV guide describes how to rip DVD to QuickTime MOV free on Mac, either for backup or for playback DVD on your QuickTime media player. MacX DVD Ripper Mac Free Edition is the best free DVD to MOV ripper which can freely rip and convert any new copy-protected DVDs to various video formats (MP4, MOV, MKV, AVI, FLV, etc) and portable devices with original quality.